It is impossible to see traffic coming from either direction on Manuka Road when attempting to exit Witheford Drive. This is due to cars parked adjacent to the pavement on both sides of the intersection (but particularly to the right). 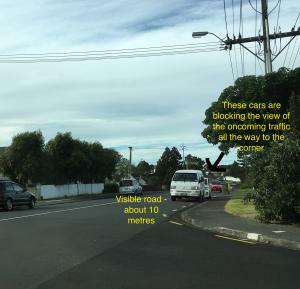 Cars come down Manuka Road at speed, and because Witheford Drive goes sharply downhill from the intersection, motorists trying to exit are below Manuka Road's street level, and cannot see over the roofs of the parked cars. The only way to see the oncoming traffic is to pull most of the way out into Manuka Road, which is dangerous in itself. Previous requests to Auckland Transport to extend the broken yellow lines to the first driveway past the intersection have been declined. Perhaps a mirror on a pole would help? We desperately need the visibility issues fixed. It's a miracle there has not been a serious collision at this intersection.